Do you dream in black and white? When it comes to bedrooms in the classic color combination, we sure do. Some hues are just better together — and black-and-white never fails in our book. In case you need an interior (or 10) to convince you that the dramatic duo is a timeless color story that works in every bedchamber, here's picture-perfect proof. Check out these high-contrast black-and-white bedroom ideas that confirm the pair will always be a decorating "do." 1. Highlight a single wall. Wallpaper is an easy way to personalize and add interest to any space. If you're worried about committing to a pattern that might overwhelm a small room, installing it on a single wall is a great alternative. Cole & Son's Nuvolette Wallpaper adds drama to this black-and-white bedroom by Daleet Spector Design which is punctuated by hints of emerald green. And there is plenty of texture in the form of a sisal rug, sheepskin throw, and walnut bedside tables that keep the space warm. Black-and-white bedroom ideas make the perfect background for vibrant pops of color. 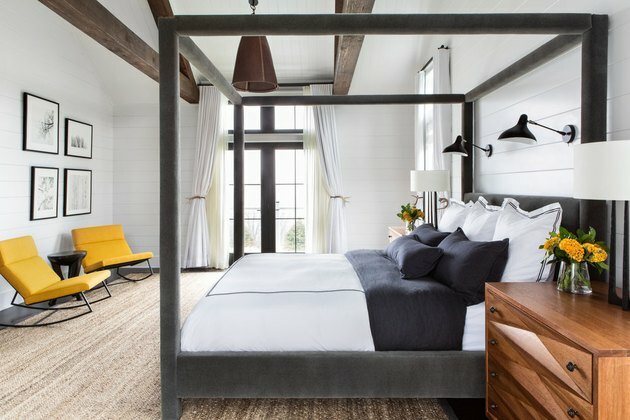 Yellow lounge chairs infuse this space designed by Chango & Co. with a sunny counterpart to a moody velvet four-poster bed, complete with black linens. Plenty of warmth and personality are added with a jute rug, exposed wood beams, leather-wrapped pendant light, and expansive end tables. Who says black-and-white bedroom ideas can't be soothing? Counter the modern vibe of the color combo by using traditional details and accessories. 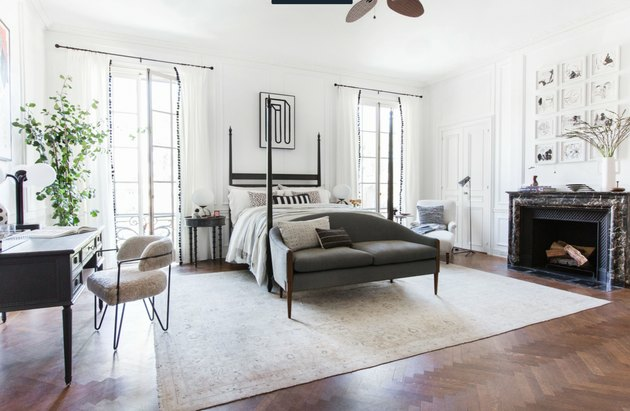 Kate Marker balances white walls and high ceilings with an oversize black linen upholstered headboard — tufted for added dimension and elegance. A brushed nickel chandelier, traditional bedside tables, and accent chair soften the graphic pillows, artwork, and window coverings. A muted area rug adds another layer of warmth to the space. 4. Let your rug do the heavy lifting. When you anchor your space with a statement-making rug, you can easily streamline the rest of the room's components. In this contemporary bedroom by Studio Life.Style, an expansive offset striped rug sets the stage for soft gray bedding, wood built-ins, and block print artwork. Task lighting and tassel-trimmed accent pillows complete the look. 5. Infuse personality through artwork. 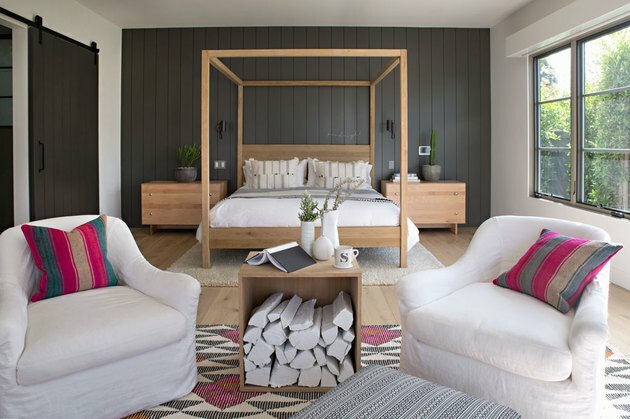 A little bit country, a little bit rock-and-roll; we love the quirky artwork in this bedroom by Consort Design. The turquoise-encrusted steer skull and mysterious painting infuse this two-tone space with personality. 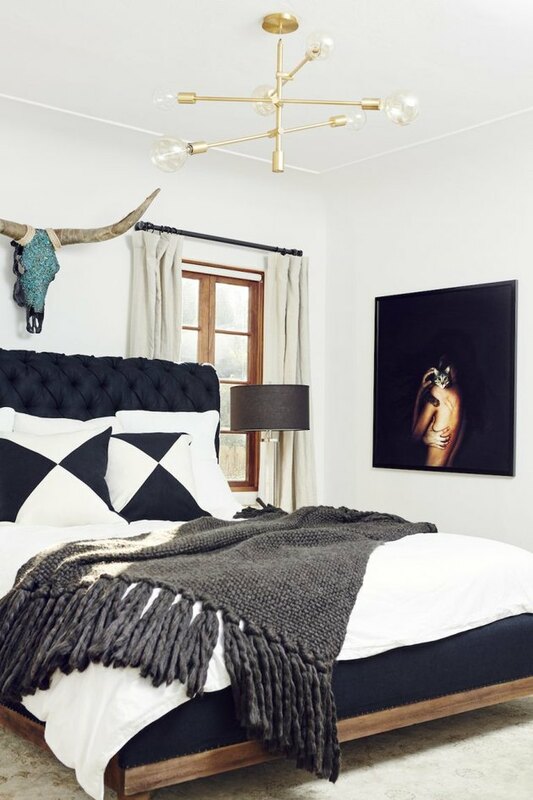 A textured fringe blanket tempers high-contrast bedding while a brass light fixture adds a touch of glam. 6. Go to the dark side (with your floors). 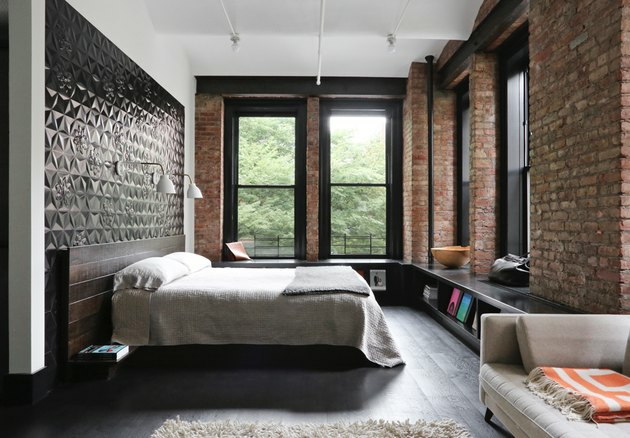 Ground a lofty space — like this bedroom by Union Studio — with ebonized, or dark-stained, wood floors. While they might require more upkeep than a lighter option, they also make a dramatic statement which we love. A glossy black, three-dimensional wallpaper paired with original brick adds texture and character and sets the stage for a simple platform bed with neutral bedding. 7. Create a modern farmhouse. The farmhouse trend is alive and well. We dig it for the accessible yet refined feeling it imparts on interiors like this cheery bedroom by Raili Clasen. A soft-black accent wall creates a focal point and is the perfect backdrop for a beautiful, warm-toned wood poster bed. Tongue-and-groove wall paneling (and peep that sliding barn door) enhances the rustic vibe. Frazada pillows and a patterned rug add playful bursts of color. 8. Don't be afraid to mix styles. Apply black-and-white in a variety of textures and patterns to achieve an eclectic and glamorous bedroom. Herringbone floors and a marble mantle are elegant foundations for this space designed by Emily Henderson that also features modern artwork, art deco lighting, traditional furniture, and classic molding. A neutral color palette unifies the space and enables all of these patterns and styles to work together. Animal-print throw pillows and pom-pom trimmed curtains are playful details. 9. Balance a rustic vibe. To keep a rustic room from looking overly, well, rustic, add in a few black elements. 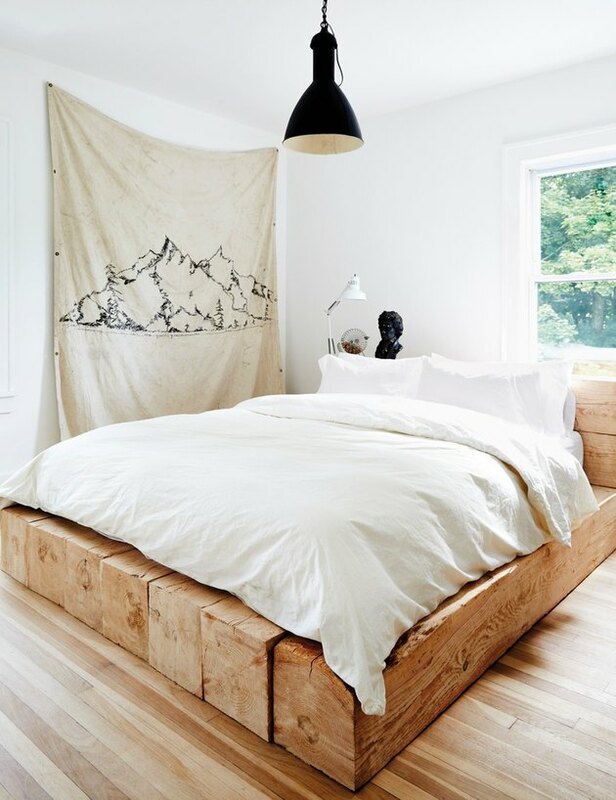 Here, Leanne Ford — known for her masterful white interiors — balances an incredible reclaimed wood platform bed with a black vintage pendant light, cheeky bust, and canvas artwork to create a unique and bright retreat with a modern twist. 10. Balance black with navy. Black-and-white bedroom ideas don't have to be austere. Case in point: this bedroom by Sarah Sherman Samuel. 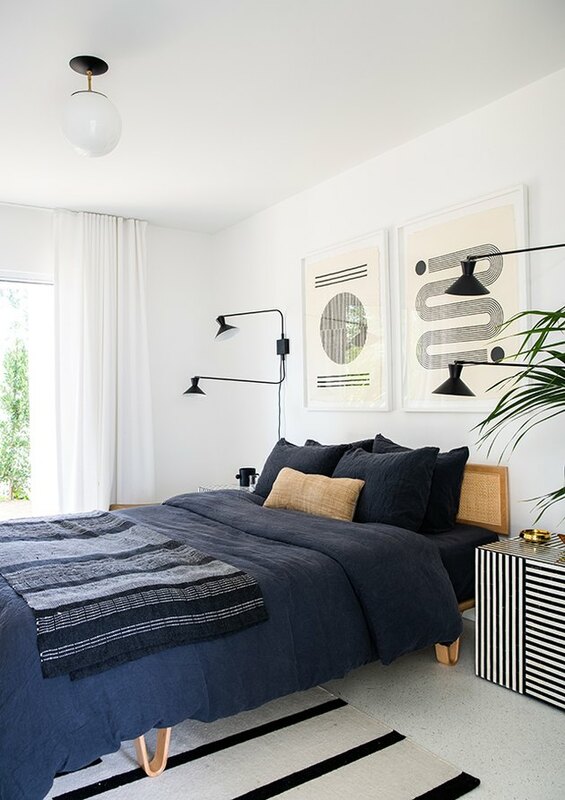 A few natural touches, like a cane headboard, tan throw pillow, and relaxed navy linen bedding, go a long way in adding warmth and approachability to a high-contrast, black-and-white bedroom. Sculptural sconces add height and interest.